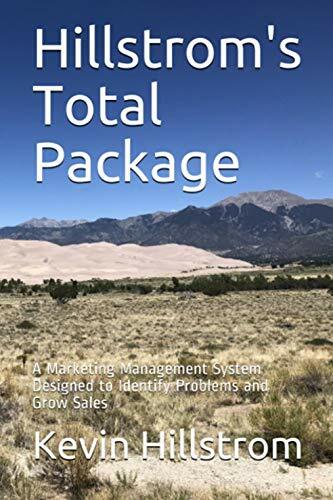 In my system, the annual repurchase rate dictates how a business needs to market to customers. This idea was ultimately borrowed from an individual named Jim Fulton - somebody I worked with twenty-five years ago at Lands' End. He ran what old-school Fingerhut employees from the 1980s would call a "nameflow model" ... he looked at a customer base, noticed that 35 of 100 would purchase again next year, and then deftly suggested that the sole purpose of this business was to find new customers, for without 65 newbies to replace the 65 that were lost, the business would rapidly shrink down to nothing. He'd attend meetings, with thick stacks of printouts, simulations he previously ran. He'd then mention how, if the business improved customer retention by 30%, from 35 of 100 repurchasing to 45 of 100 repurchasing, the business would still have to find 55 new customers to keep the wheels on the bus. He'd make these statements, look around the room hoping to find kind approval for his ideas, and instead be met with blank stares. The room would move on to new ideas to grow customer loyalty. Mr. Fulton would move on to another simulated run of customer behavior. Meanwhile, I decided to borrow elements of his worldview - the fusion of new customers and annual repurchase rate would become Exhibit A in my system. Most of the companies I work with in my consulting endeavors possess customer bases with a 25% to 45% annual repurchase rate. When your annual repurchase rate is between 25% and 45%, you are essentially locked-in to a business model where you must find new customers for success. Especially in catalog marketing, this annual repurchase rate is largely ignored. Countless catalogers look at a 33% annual repurchase rate, and immediately think, "how can we force customers to become more loyal?" Catalogers that have been trying to encourage customers to become more loyal since 1979 are still battling the same issue. You're never going to encourage customers to become more loyal. Never. And even if you succeed ... you increase customer loyalty by 20% ... you've only increased your annual repurchase rate among twelve-month buyers from 33% to 40% ... you still need to find 60 new customers to replace the ones you lost ... you are still fully dependent upon new customers for success. 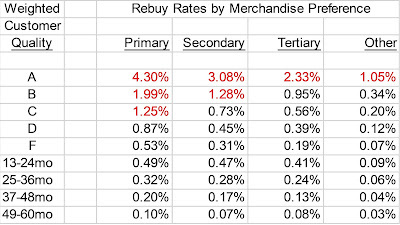 In my system, the first step is to identify the annual repurchase rate. If the rate is low (i.e. 40%), then the purpose of the marketing team is to find new customers ... plain and simple. In those cases, my second step is to measure customer acquisition success over time ... I'll find that the best years for sales growth are the years when customer acquisition was maximized ... and more interestingly, I'll find that the best years for profit are the years after a ton of customers were acquired (because a fraction of the newly acquired customers repurchase, generating profit). This is a key element to my "system" or "program" - annual repurchase rates are comparable to a doctor measuring blood pressure paired with a blood test to measure overall patient health.